Some of our partners have learned about connectivity issues the hard way: during deployment. As many of us know, a lot of time is spent putting together proposals for the best solutions for customers. They can go with either a customer-managed network with straightforward GUIs or a turnkey system as in the SAAS models. Then there is choosing the best displays and mounts, selecting the right content provider, updating schedules and loop durations, and covering AC power and installation issues. Through all of the presentations, Q&As, and negotiations, almost everything is covered from inception to deployment. When it comes to connectivity, everyone assumes that the customer’s WAN can be used for the new network. Typically, the connectivity issue hits a snag during the initial installations. Things such as connection speed, static IP addresses, routing, firewall, and other security concerns come to the forefront. Trust me — crashing a customer’s network (which includes POS and transactions) will send you to the top of a very unpopular list. One simple way to overcome this problem is installing a dedicated circuit exclusively for the new network. This is a great solution if you have a small number of sites. If you are deploying tens to hundreds of sites, this can become very expensive. Each site has a “commercial” high-speed connection of $50-$80 per month. 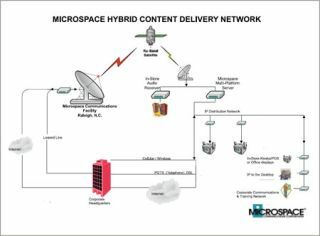 One way to overcome all of the issues associated with using wired terrestrial networks is to use broadcast satellite for content delivery. Using broadcast satellite offers a fixed monthly cost for a dedicated amount of throughput. This monthly cost is not affected by the number of sites you may be delivering your content. The more sites in the network, the less cost per site per month you incur. In addition, we can add a wireless channel for the return data. Since most of the traffic on a signage network is outbound, the satellite channel is the most reliable and cost-effective method to distribute the content to each site. The traffic on the return channel is normally very small and is used mainly for health/status and affidavits. There are many distribution network architectures available including 3G/4G cellular, terrestrial wired (cable and DSL), terrestrial Datacast, satellite broadcast, and Satellite Very- Small-Aperture-Terminal (VSAT) to name those that are currently in use. Terrestrial Datacast uses broadcast television spectrum for limited data broadcasts. If you have a large number of sites in one city (or DMA) and do not need a large delivery pipe, then this could be of use. However, if you have deployments in several different markets or multiple DMAs, then this could get very expensive as some broadcasters charge per city or DMA. Again this is a broadcast, so if a back channel is needed, cellular or wired terrestrial would be a requirement. Very Small Aperture Terminal (VSAT) is a two-way satellite platform that allows communication to and from the deployed site. This varies from a broadcast satellite platform in that each site incurs a monthly cost. It is not a “fixed monthly” cost as in the broadcast satellite. The VSAT back-channel speed varies, but normally is quite smaller than the outbound transmission. A communications network provider such as Microspace will be able to assist you once you have the above data available. The solution is straightforward — once you know the lay of the land and your customer’s needs. Greg Weaver (gweaver@microspace.com) is manager, digital signage networks, at MicroSpace.